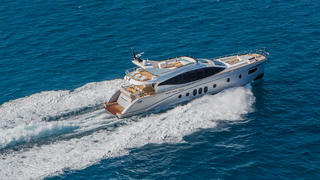 The brand new 27.4 metre motor yacht V86 has been listed for sale by Gregory Gheraia at Blackorange Yachts. Built on spec by Italian yard Versilcraft in GRP to RINA class, she is the first model in this range and was delivered as recently as August 2016. The colour scheme throughout this first vessel employs light wood joinery and a grey palette for soft furnishings, and she accommodates eight guests in four cabins. These consist of a master suite, VIP suite and two twins, all with entertainment centres, television screens and full en suite bathroom facilities. The saloon has full height windows allowing daylight to flood in and offers comfortable seating and an entertainment centre including a large television screen and a server delivering on-demand video and audio throughout this yacht for sale. A notable feature for lovers of the outdoors is its open plan sun deck, which is entirely dedicated to al fresco relaxation, offering ample sun pads and a large outdoor settee. More sunbathing in complete privacy is available on an extensive foredeck seating area ideal for relaxation when moored stern to in port. Three Volvo Penta IPS engines give her a cruising speed of 24 knots and she is fitted with zero speed stabilisers for complete comfort at sea and in port. Lying in Genoa, Italy, the V86 is asking €4.4 million.